Sunni Muslim tribal leader Sheikh Abu Risha, was killed by a roadside bomb on Thursday. Sheikh Abu Risha was one of the United States' highest-profile allies in Iraq could undermine U.S. attempts to recruit former foes to stabilize the country. Sheik Abdul-Sattar Abu Risha, who as head of the Anbar Salvation Council met with President Bush in Iraq less than two weeks ago, had just left a ceremonial building where sheiks greet guests and was returning home when a bomb ripped through his armored vehicle, killing him, his nephew and two bodyguards. Interior Ministry spokesman Abdel Karim Khalaf said it was unclear who was responsible for the blast. Suspicion immediately fell on al-Qaida in Iraq, but the organization hadn't claimed credit for the killing by Thursday night. Others suggested Abu Risha could have fallen victim to rival Sunnis worried about political competition. 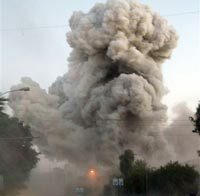 The timing of the explosion, hours before Bush was to give a nationally televised address on Iraq policy, was a reminder of the tenuous nature of U.S. claims of success in Anbar province, where tribal rebellions against al-Qaida in Iraq have become the Bush administration's No. 1 example of military progress here. "A year ago the province was assessed 'lost' politically," Gen. David Petraeus, the top U.S. commander in Iraq, told a congressional hearing Monday. "Today, it is a model of what happens when local leaders and citizens decide to oppose al-Qaida and reject its Taliban-like ideology."